I can’t wait for spring and to arrive so I can enjoy the outdoors in New York City with my son! MJ keeps begging me to go to the beach and it’s time to purchase new swim suits to fit his rapidly growing figure. The UK based online retailer Alex and Alexa named after founders Alex Theophanous and Alexa Till, offer shoppers designer clothing, shoes and gifts for children from the most famous international brands. There is a delightful blend of luxury labels and contemporary clothing lines. You can find the latest kids fashions from the comfort of your home and you don’t have to drag your poor kids on a shopping spree at the local mall. I spent the afternoon browsing the Spring Forward campaign and loved the new styles for the upcoming season. Alexa and Alexa are the sponsors of the world’s first Global Kids Fashion Week March 18-20 2013. This event serves as a fundraiser for London charity Kids Company. This dress is a playful rendition of the classic girl’s sailor dress. Add some yellow or red flats and you have a great summer outfit. Diesel is one of my favorite brands. This tee is so hip and is great with a pair of black jeans or cargo shorts. Beautifully crafted leather shoes with complimentary color blocking navy, orange and tan. This shirt has an out of this world design (get it?) and it’s organic cotton too! Tapete also has a rocket ship tee. This is a glamorous one piece leopard print swim suit with soft ruffles adorning the neckline. The heart print one piece suit for babies is amazing since there are snaps for fast diaper changes. There is also a version for older girls. I think these trunks are absolutely adorable! The graphics are so cool with a couple of the duck wearing black sunglasses. Floral is the latest fabulous print this spring, this dress is reminiscent of the 1980’s Laura Ashley designs! These shorts are made out of light weight denim with comfortable navy ribbed waistband. 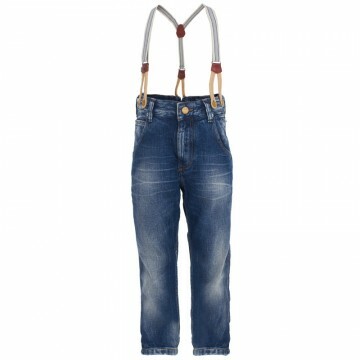 Coordinating detachable braces (Suspenders) in two types of denim washes by the Amsterdam based company. This entry was posted in Boys Fashion, girl fashion, Opinions, style and tagged Alex Theophanous, Alexa, Alexa Till, Babies, Boat shoes, Diesel, DKNY, global kids fashion week, Kids Company, Kids spring fashion, London, Mayoral Nautical Dress, New York City, Paul Smith Junior, Rachel Riley, Roberto Cavalli, Scotch Shrunk, Shopping, Spring fashion, Tapete. Bookmark the permalink.